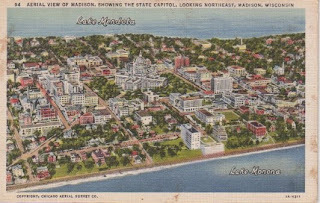 Another Madison postcard, this one showing Madison's signature lakes, isthmus, of course, the state capitol. Other details to notice - the lack of John Nolen Drive, and, of course Monona Terrace. Long-time Madison residents - what else has changed? This card was never used, so there's no fun note to transcribe.